Marijuana refers to the plant scientifically known as cannabis; more specifically, three recognized species include Cannabis sativa, Cannabis indica and Cannabis ruderalis. The cannabis plant is a source of over 400 compounds, including 60 cannabinoids. Of the 60 cannabinoids, two in particular, delta-9-tetrahydrocannabinol (THC) or dronabinol, and cannabidiol, are the most widely tested for medicinal uses. In the U.S., twenty-nine states and the District of Columbia have legalized medical marijuana use, although it is still an illegal commodity at the federal level. Apart from these, some states (18 of them) have limited the use of marijuana to the non-psychoactive marijuana extract called cannabidiol, or CBD. Certain other states have laws that require doctors to prescribe marijuana. Meanwhile, nine states have legalized recreational marijuana use. 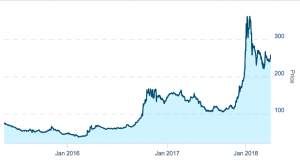 Even as marijuana is going through the process of mainstream acceptance, the investment community has moved in to capitalize as much as possible. Arcview Market Research, which claims to be the top cannabis market research company, said in its fourth edition of The State of Legal Marijuana Markets report, that legal marijuana sales could lock in at $21.8 billion by 2020. Meanwhile, states that have legalized recreational marijuana are expected to further boost the industry. Colorado, which legalized recreational marijuana in 2012, now profits about $1 billion per year from weed sales. Marijuana stocks make the cut in terms of high-risk assets, given the increasing acceptance of weed among the general public and the huge market opportunity laid out before the marijuana companies. The marijuana market currently comprises several smaller players with limited market share. Therefore, most of them aren’t big enough to trade on the main exchanges and instead trade on over-the-counter (OTC) exchanges or are backed by venture capital funds. Because of marijuana’s liminal legal status, companies in the industry are not subject to the same level of regulatory scrutiny. As a result, it’s important for investors to be wary of which companies they invest in, as they can be taken for a ride. Pump-and-dump operators fleece investors by artificially inflating stocks and then dumping them after making staggering profits. The U.S. Marijuana Index, which has been in existence since January 2015, has been fairly volatile. From a high of 126.98 in mid-January 2015, the index fell steadily over a year, reaching a bottom in mid-February of 2016. After a small rebound and a consolidation move until August 2016, the index saw a pre-presidential election run up on hopes of more states legalizing marijuana. The index hit a high of 110.64 in late October 2016. Subsequently, it experienced a pullback and has currently settled around a support around 50. Minimum market capitalization of $30 million. Daily trading volume of $600,000. Stock price that is at least 10 cents. Companies with revenues over $5 million per year are exempt from these listing standards. GW Pharmaceuticals PLC- ADR (NASDAQ:GWPH): Since its listing on the NASDAQ on May 1, cannabinoid drug maker GW Pharma has gained 1,400 percent. The gains are staggering when compared to the NASDAQ Composite (INDEXNASDAQ:.IXIC), which has been up a more modest 104 percent in the same period. This company, with a market capitalization of $3.68 billion, is considered to be more of a biopharma company developing therapies using cannabinoids. Its lead candidate, namely Epidiolex, a liquid formulation of cannabis-derived cannabidiol, is being tested for several epilepsy syndromes. GW Pharma’s Sativex, the first prescription medicine derived from the marijuana plant, has been approved for Multiple Sclerosis spasticity and neuropathic pain in 29 countries outside of the U.S. The company earned revenues of $11 million in fiscal year 2017. CANOPY GROWTH CORP COM NPV (OTCMKTS:TWMJF) has gained 738.8 percent since its listing in April 2014. This Canadian company is focused on inorganic growth, as well as export of marijuana to countries which have legalized medical marijuana. For their 2017 fiscal year, which ended March 31, 2017, Canopy Growth posted C$39.90 million in revenue or $32 million. APHRIA INC COM NPV (OTCMKTS:APHQF) is another Canadian marijuana company primarily focused on organic growth. Since its listing in March 2015, the stock has gained 1,200 percent. The company reported revenues of C$20.44 million or $16 million for the fiscal year, which ended May 31, 2017. Canada has been a land of opportunity for marijuana companies, most of which are homegrown. The nation approved medicinal use about 20 years ago. The Canadian government has already passed a bill to legalize the growth, sale and consumption of recreational marijuana, which is expected to become a law by July 1, 2018. There are several avenues for those investors, who are looking out for a promising opportunity in the marijuana industry. Chose an online broker, and then go from there. Earlier this year, Canada launched its first ETF based on marijuana stocks, named Horizons Medical Marijuana Life Sciences ETF, which began trading on the Toronto Stock Exchange. This ETF has 14 underlying stocks, with bulk of them being Canadian companies. In February, the ETF Managers Tryst filed with the SEC to launch an ETF called the Emerging AgroSphere ETF, which was supposed to use a replication strategy. Companies engaged in lawful medical research to produce government-approved prescription drugs using natural or synthetic versions of CBD and other cannabis-based extracts. Production or sale of products which are legal derivatives of industrial hemp. Involved in the supply chain of either category of company. In addition, ETFMG Alternative Harvest ETF manages over $375,000,000; check out holdings and performance details. Some biopharma companies might also have one or more cannabis-based drugs in their portfolios. AbbVie Inc (NYSE:ABBV)’s Marinol, which is a synthetic form of THC, has been approved for chemotherapy-induced nausea and vomiting and anorexia, resulting from AIDS or cancer. Insys Therapeutics Inc (NASDAQ:INSY) has two FDA-approved drug, one named Subsys, which is a regular drug and fetched the company the lion’s share of its revenues, another named Syndros, which is an oral dronabionl solution or a synthetic form of THC just like AbbVie’s. Valeant Pharmaceuticals Intl Inc (NYSE:VRX)’s Nabilone, marketed under the trade name Cesamet, is a synthetic cannabinoid. It is used to treat nausea and vomiting in cancer chemotherapy patients who have failed to respond adequately to conventional anti-emetic treatments. Scotts Miracle-Gro Co (NYSE:SMG) has exposure to the industry by way of its hydroponics business, which is a technique of growing plants without soil that is frequently used in marijuana cultivation. It also supplies pesticides for the marijuana industry. LED manufacturer Cree, Inc. (NASDAQ:CREE) has a surprising marijuana exposure. The marijuana industry traditionally uses high-pressure sodium lights to grow cannabis. Given the environmental unfriendliness and high cost of this option, Cree’s LED lighting is now being considered a viable alternative. For investors who still need more guidance, the Marijuana Index can be the launch pad for your entry into this very special market, as it showcases index trends and index news. Investors can dig into equally-weighted stock indices that track the leading cannabis stocks in the U.S. and Canada.